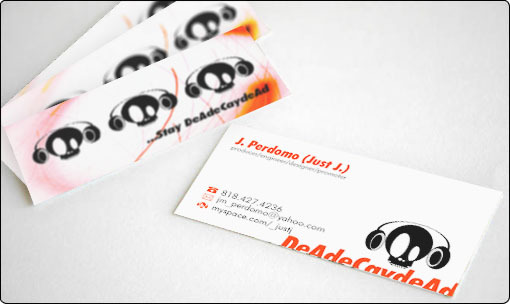 J. Perdomo wanted a fresh and hip looking business card for his brand. The logo was provided to implement in it, and the project began. Experiments with colors led me to choose a vibrant shade of orange to make everything stand out, from the back of the card, to the name of the client and icons on it. However, the design didn’t feel complete, until typographic cropped elements were implemented on the lower corner of it. 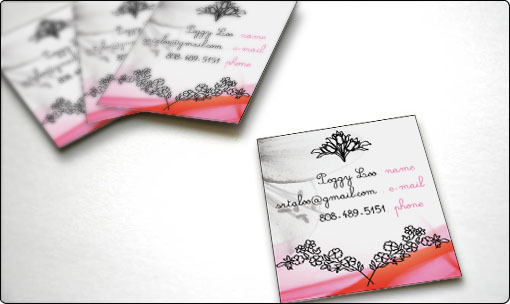 Peggy Loo wanted a personal card to stand out from the crowd and her bunch of friends, which led me to illustrate some graphics, while also using textures and shades. She also requested something different to what her line of work are used to, as she feels being a system engineer can be quite boring and stressful. Typographic elements were only use to display the person’s information in a simple and direct way, as well as the use of colors. Version 5? Flash/XML based portfolio to display video, photographs, drawings, etc.